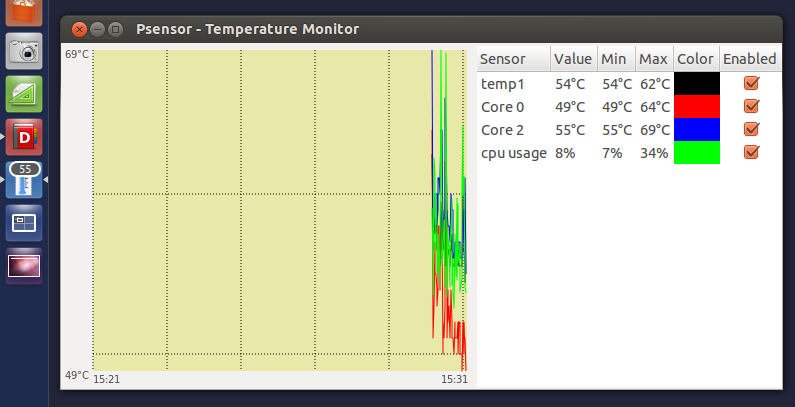 Psensor is a simple tool for monitoring hardware sensors, including temperatures and fan speeds. It displays a curve for each sensor, alerts user using desktop notifications and application indicator when a temperature is too high. Psensor also integrates nicely with Unity as it can display current temperature as a badge on Unity launcher. GTK v2 is no more supported. Added support for libatasmart for sata disk monitoring (–use-libsatasmart option). Measures of the sensors are logged when log level is set to 3. Improved translations support (Chinese, French, Hungarian, Brazilian, Italian, Russian, Serbian Ukrainian Slovenian and German). Added low thresold support for alerts.